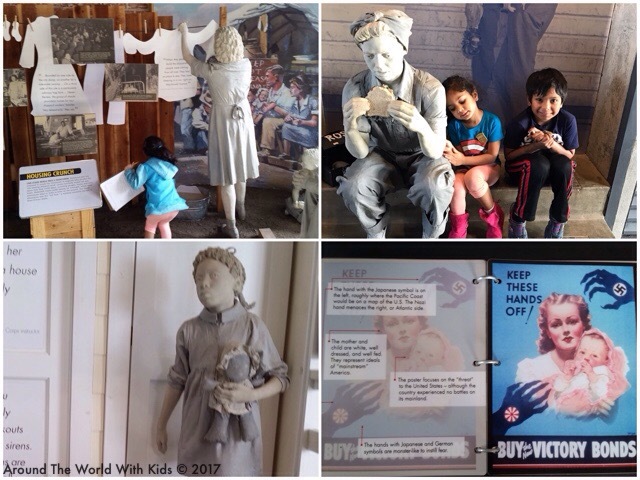 The Rosie the Riveter WWII Home Front National Historical Park has been on my to-do list for a ridiculously long time. I found out about it’s existence a year and a half ago but I didn’t ever seem to find time to get over there. Then, after a sad week, I put the kids and the husband in the car on a whim and we drove over to Point Richmond. Rosie the Riveter was not actually a person, but the name given to a woman working in the factories during World War II. 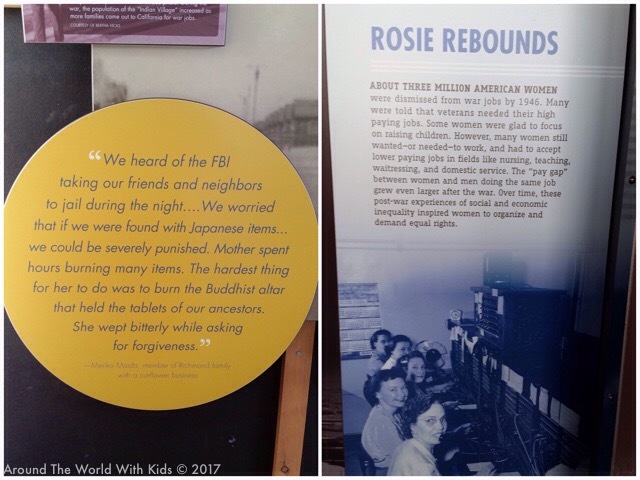 “Rosies”, as the women were called, came from all over the US to take jobs in the shipyards of Richmond, run by Henry J Kaiser. Using a assembly line process, ships were put together a neck breaking pace – the fastest ship was put together in merely 4.5 days and roughly 780 ships were built in 3 years in the height of WWII. Women came to be electricians, welders, boiler-workers and scalers. 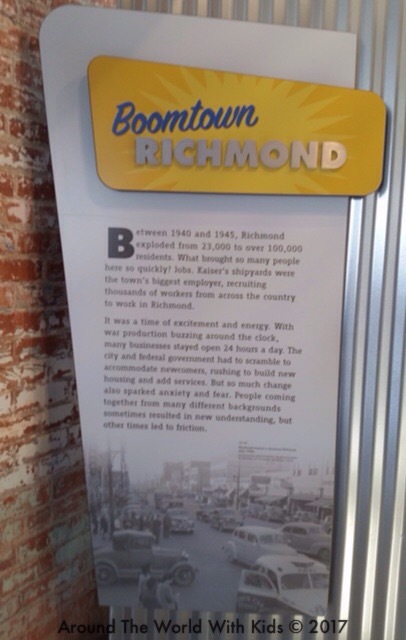 The city of Richmond went from a population of 23,000 to more than 100,000 in just two years. 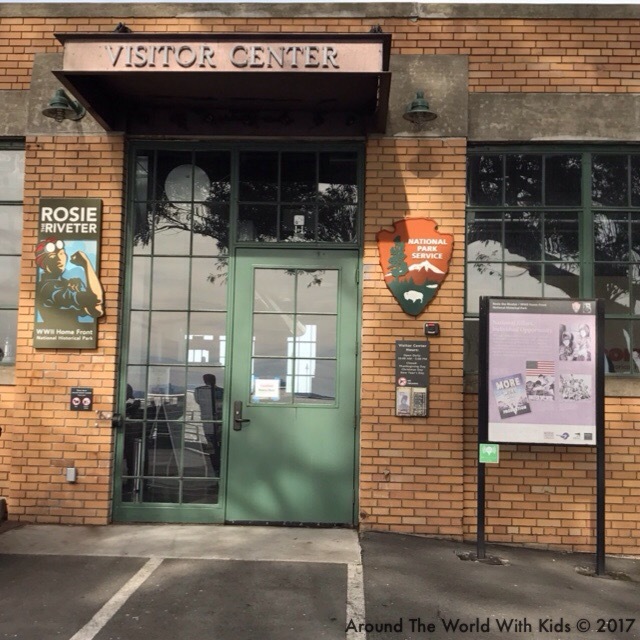 The Rosie the Riveter Visitor’s Center is along the San Francisco Bay Trail, next to an old Ford Factory, and overlooking the beautiful San Francisco Bay. Entering in the center, our first stop was the front desk, where we got the lay of the land and two Junior Ranger activity kits. Our next stop, at their. Ranger’s suggestion, was the movie theater downstairs. The center shows movies every ½ hour, and has two different options. 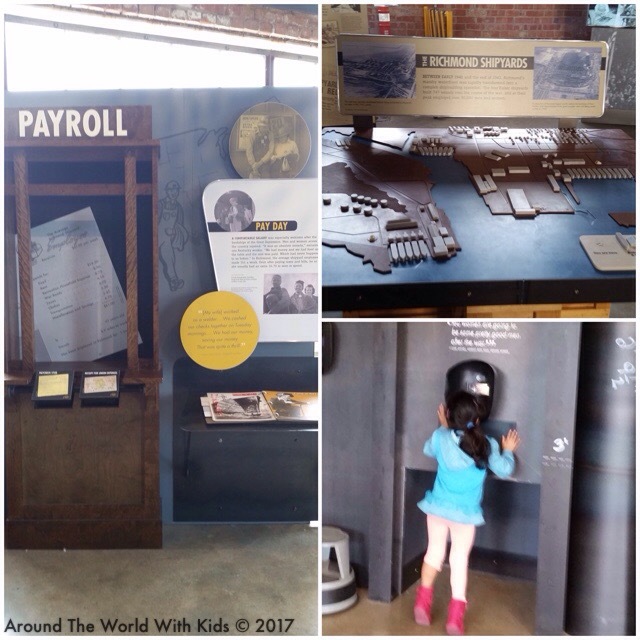 We watched “Heroes on the Homefront”, a short movie about the changes Richmond saw in the war years due to the ship building industry and influx of diversity. One of the most interesting facts I learned was that the most popular graduation gifts for young black women in the south was train or bus tickets out west. The theory being that they would be able to find better work and be treated better than in the south. I would be remiss if I didn’t also talk about the art work in the visitor center. There were several beautiful statues of people in that day and time. A Rosie eating her lunch, an African American Girl out playing, and a line of locals as they would have been dressed. They were all done in gray concrete, but had amazing detail including the folds of the close, and the imprints in buttons. The life-like images helped you really imagine you were back in that time, and understand the people and how they lived. 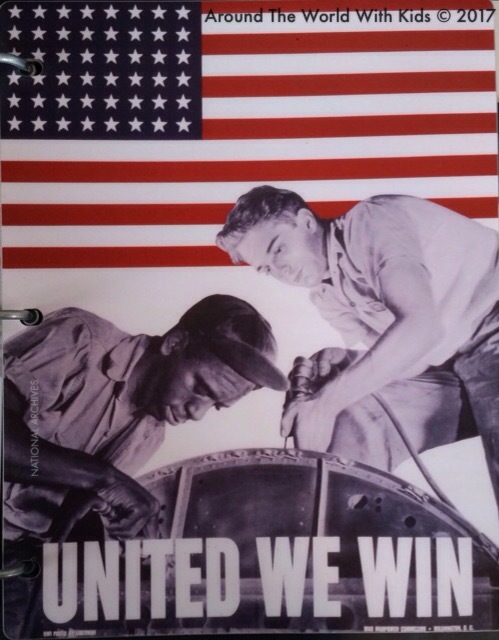 In addition to it’s own art, there was a great collection of war time posters and images. One of my favorite exhibits was a binder, showing some popular posters and what the imagery was supposed to convey. 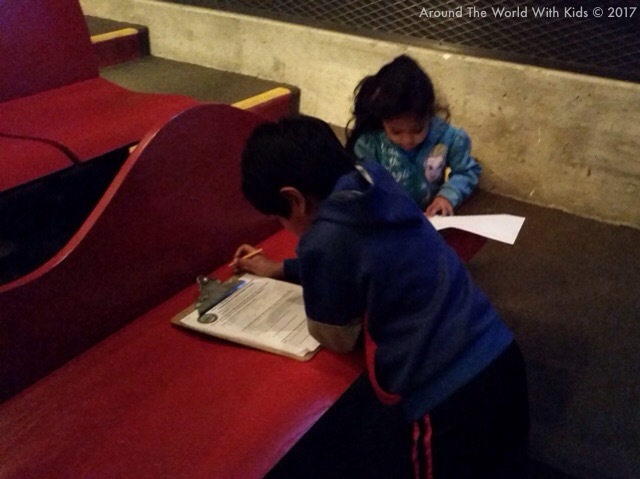 At the end was an area where people could write their thoughts about the museum and what they learned. Children drew pictures and adults generally wrote messages of thanks. It was a beautiful way to cap the end of the museum and learning. Afterward, my kids reported to the front desk to turn in their Junior Ranger worksheets. 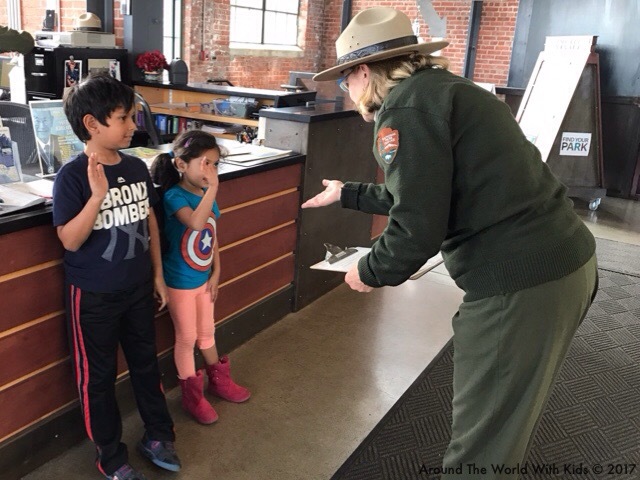 They answered questions about what they learned to the Park Ranger, and then were asked to take the Jr. Park Ranger pledge. Afterward they were each given Jr. Park Ranger badges, and both left feeling they needed to take their responsibility of “protecting all National Parks” seriously. Afterward, the two were tired, so we skipped the Memorial park and headed back to the house. The visit was just what I needed. It’s a remarkable reminder of the strength and tenacity of American women and minorities. It shows the wonderful things we can build when we work together as a united society. And it teaches us humble lessons about the atrocities that can happen when we let hate, fear, and “war hysteria” cloud our better judgement. But overall it restored my faith in the American ideals and society I’ve come to love. It’s a beautiful place to spend an hour or two to renew your spirit.